Admit it: the Chinese New Year is a dreaded holiday. Every year, we’re pestered with repetitive questions that drive us up the wall. 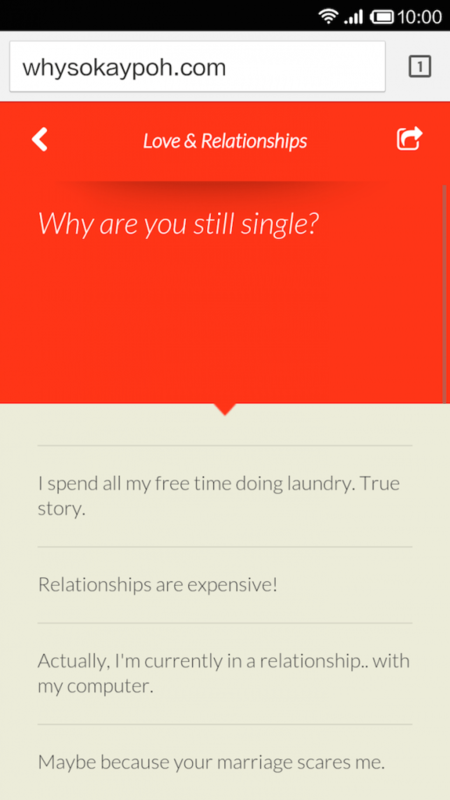 Why are you still single? How many As did you get for your O Levels? How much is your salary? For crying out loud, why is everyone else so obsessed with your private life? It feels more like an interrogation than a family reunion. Despite getting cheesed off, you hold your tongue, because at the end of the day, you are still your mother’s child. But here’s an app you should keep close to. Wunderman and Comwerks, an advertising agency located in Singapore, came up with Why so Kapoh, a witty web-based app that guides you to get even with your relatives. With this baby, your relatives won’t ever bombard you with pesky enquiries again. Why so Kapoh has touched on most of the things that are very important to us. It has a total of five categories: Lifestyle, Career & Money, School, Marriage, and Love & Relationships. Simply open the desired topic and pick your favourite comeback. Each question has quite a number of witty responses, so be prepared to be spoilt for choice. Take a look at the screenshot below and I bet it’ll have you snickering. Anyone (read: me) who enjoys sardonic humour and clever rebuttals will appreciate it, for sure. Repeat that last line. Can you imagine your uncle’s expression if you say this to him? Of course, bear in mind that this is all in good fun. Who knows what’s going to happen if you overplay? Fact: not all of us have a sense of humour. Overall, I think that this is a great web-based app. It’s easy to navigate and the content never fails to make me chuckle. These are just some of the highlights of Why so Kapoh. If you think this app is going to be a convenient tool during the CNY season, skip over here and bookmark it!